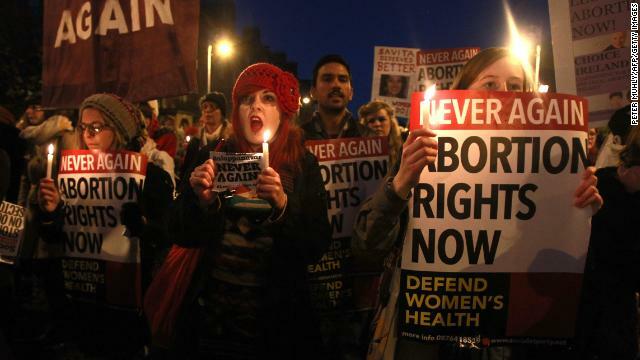 Demonstrators hold placards and candles in memory of Savita Halappanavar on November 17 in Dublin, Ireland. Editor's note: Latanya Mapp Frett is a vice president of Planned Parenthood Federation of America and leads its international arm, Planned Parenthood Global. (CNN) - Savita Halappanavar died last month in Ireland after being denied a lifesaving abortion. If she had lived in the United States - where in two months we will mark four decades of safe and legal abortion on the anniversary of the Roe v. Wade ruling - she likely would be alive today. I was a little girl when this decision overturned state bans across the country that prevented women from access to medically safe procedures. Unlike my mother's generation - when women often died from self-induced abortions or back-alley abortions performed by a person with no skills or training, often under unsanitary conditions - my siblings, friends, classmates and I grew up with the ability to make informed decisions when faced with an unintended or medically problematic pregnancy. Worldwide, many women are unable to make personal health decisions. The consequences are grave. According to a World Health Organization report, about 47,000 women die each year around the world from unsafe abortions. This accounts for about 13% of all maternal deaths. Most of these women die in developing countries, where severe legal restrictions and lack of access to modern medical care drive women to seek unsafe procedures. By contrast, abortion in the United States is incredibly safe: Fewer than 0.3% of women experience complications that require hospitalization. Cananea, Mexico (CNN) - In a remote town in northern Mexico, a 10-year-old-boy is struggling with his homework. His name is Oscar Castellanos, and the fifth-grader is getting extra help from his father because he's having trouble adjusting to his new school. The student enrolled at Leona Vicario Elementary in the town of Cananea is technically a foreigner in his father's land. Oscar was born in Arizona and is a U.S. citizen. He recites the U.S. Pledge of Allegiance by memory without hesitation. His English accent is that of a boy raised in the American Southwest. Oscar's family moved back to Mexico after the state of Arizona approved some of the toughest immigration laws in the United States. Now they live in Cananea, a mining town of 30,000, about 35 miles south of the U.S.-Mexico border. When asked whether it's been difficult to adjust to life in Mexico, his answer is "kind of." Pressed to elaborate, he adds that one of his main challenges is having "to speak another language." Oscar says he misses the abundance of books available to him in his American schools. In Mexico, textbooks are free, but finding additional reading material is often a challenge, especially in a provincial town that's a 23-hour drive from Mexico City. 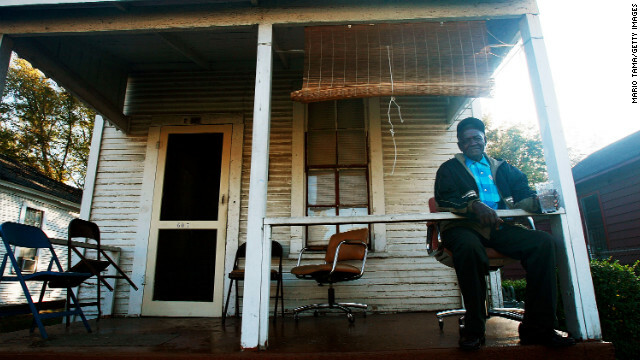 Emmitt Coleman, 81, relaxes after voting in Alabama. An Alabama county has taken the Voting Rights Act to the Supreme Court. (CNN) - How much has the South changed? That's the question at the heart of one of the most important cases the Supreme Court will take up this year. The case weighs the fate of one of the most important laws in American history: the Voting Rights Act of 1965. A century after the Civil War, Congress created that law to give African Americans the right to vote, not just on paper, but in fact. The key provision was Section 5, which decreed that jurisdictions with histories of discrimination, mostly in the South, had to get Justice Department approval before they changed any aspect of their voting rules, right down to the location of polling places. There is little doubt that, in the years immediately after 1965, the Voting Rights Act achieved a revolution in voting rights for African-Americans in the South. In subsequent years, Congress has reauthorized the law several times, most recently in 2006. Increasingly, covered jurisdictions have found the process of submitting their changes to the Justice Department, which is known as "pre-clearance," as a demeaning anachronism, and Shelby County, Alabama, went to court to argue that the Voting Rights Act was unconstitutional. The court will hear the case, Shelby County v. Holder, early next year.